Some of the most powerful jQuery tools are actually the easiest to use in HTML5 and CSS3 programming. 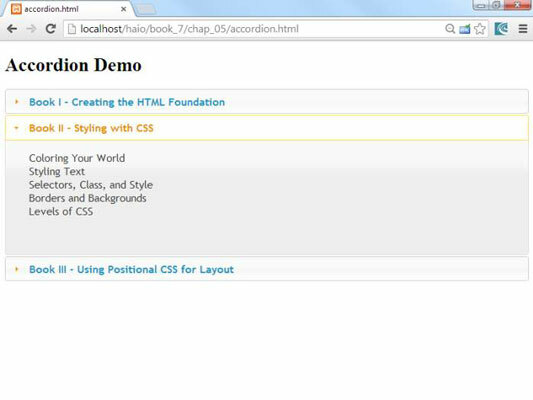 The accordion widget has become an extremely popular part of the jQuery UI toolset. Here, you see book headings. The details for the first one are available, but the other books’ details are hidden. This marvelous effect allows the user to focus on a particular part of a larger context while seeing the overall outline. It’s called an accordion because the various pieces expand and contract to allow the user to focus on a part without losing place of its position. Collapsible content has become an important usability tool made popular by the system bar in Mac OS and other popular usability tools. Import all the usual suspects. Build your HTML page as normal. Build an HTML page as you would normally do. Pay attention to the sections that you want to collapse. There should normally be a heading tag for each element, all at the same level. Create a div that contains the entire collapsible content. Put all the collapsible content in a single div with an ID. You’ll be turning this div into an accordion jQuery element. Add an anchor around each heading you want to specify as collapsible. Place an empty anchor tag (<a href=”#”></a>) around each heading that you want to use as a collapsible heading. The sign indicates that the anchor will call the same page and is used as a placeholder by the jQuery UI engine. You can add the anchor directly in the HTML or through jQuery code. Use the normal techniques to build a jQuery initializer. 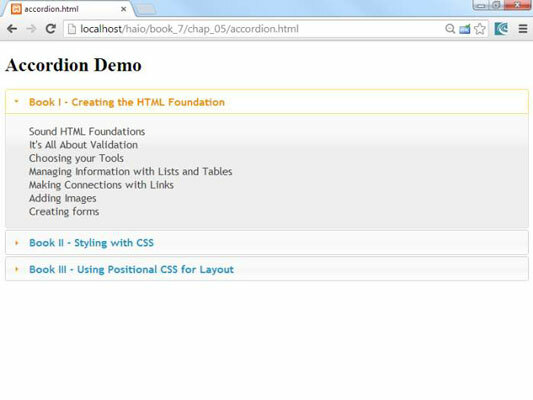 Apply the accordion() method to the div.